Who Was the "Gerry" of Gerrymandering? Earlier this year, President Obama gave his final State of the Union address. Toward the end, he took aim at a centuries-old issue. “I think we’ve got to end the practice of drawing our congressional districts so that politicians can pick their voters and not the other way around,” the commander-in-chief said. Applause ensued. How, exactly, do elected officials “pick their voters,” as the president claimed? Their main tactic is as simple as it is unfair. By redrawing the borders of electoral districts, members of a given political party can cram the opposition’s supporters into as few precincts as possible—thus grabbing a disproportionate amount of power. Today, we call this tactic “Gerrymandering.” It's named after a man who helped make the Bill of Rights happen, a one-time Vice President, and the only signer of the Declaration of Independence who's buried in Washington D.C.
Elbridge Gerry was born on July 17, 1744. He was a native of Marblehead, Massachusetts, and both his parents were linked to the merchant business. Gerry took up the trade in 1762 and became an exporter of cod (a profitable fish upon which countless fortunes have been built). In 1787, with the war long over, Gerry took part in the Constitutional Convention. The importance of his presence cannot be understated. After all, it was he who moved to include a Bill of Rights—an idea that his colleagues shot down. Five days after the proposal, the newly completed constitution was ready to be signed. Since a Bill of Rights was nowhere to be found, Gerry—along with just two other delegates who made it to the end of the Convention—withheld his signature. A subsequent letter to the Massachusetts State Legislature explained this choice. “It was painful for me, on a subject of such national importance, to differ from the respectable members who signed the Constitution; but conceiving, as I did, that the liberties of America were not secured by the system, it was my duty to oppose it,” Gerry stated. He may have lost that battle, but he ultimately won the war. Thanks in part to dissenters like him, a 10-amendment Bill of Rights was formally adopted on December 15, 1791. Had he retired from politics right then and there, Elbridge Gerry might have gone down in history as the “Father of the Bill of Rights.” Instead, he’s remembered first and foremost for another, less admirable claim to fame. Massachusetts made Gerry its eighth governor in 1810. By then, America had turned into a nation divided. Two rival parties now split the electorate: Thomas Jefferson’s Democratic-Republicans and the late Alexander Hamilton’s Federalists. Gerry belonged to the former group, which backed his successful re-election campaign in 1811. At the time, Democratic-Republicans represented the Massachusetts legislature’s majority party. This gave them enough votes to pull off a rather devious scheme that secured big wins in the state Senate one year later. The plan was brilliant in its straightforwardness. Early in 1812, Democratic-Republican legislators laid out brand new districts which shoehorned most Federalist Party supporters into a handful of precincts. Behind closed doors, Governor Gerry denounced this plot, calling it “highly disagreeable.” Unfortunately, that didn’t stop him from signing the proposed new districts into law anyway. The result was a monstrously slanted election season. Overall, Federalist candidates for the state Senate earned 1602 more votes than their Jeffersonian opponents did. Yet, because of these new precincts, the Democratic-Republican Party nabbed 29 seats to the Federalist’s 11. The new state electoral map looked positively absurd. Thanks to partisan manipulation, districts now came in all manner of spastic shapes. Particularly infamous was one such division in Essex County. To the staff of The Weekly Messenger—a prominent Federalist newspaper—this squiggly precinct looked like a mythical salamander. Thus, the name “Gerrymander” was born—and it stuck. The Federalist surge meant that Governor Gerry was ousted from office, but Gerry’s career wasn’t quite over yet. On the contrary, it saw a swift rebound when James Madison chose him to become his second Vice President the following year. But like Madison’s previous VP, Gerry didn’t last long. 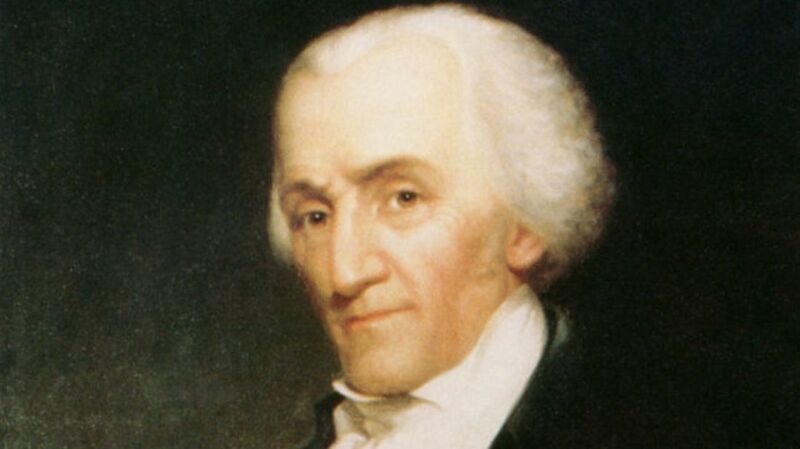 Death took him while he was still in office on November 23, 1814.